This catalogue of a centennial exhibition of World War I literary and visual materials in the collection of the Harry Ransom Center at the University of Texas at Austin illuminates the lived experience of the war and its impact on soldiers and civilians. 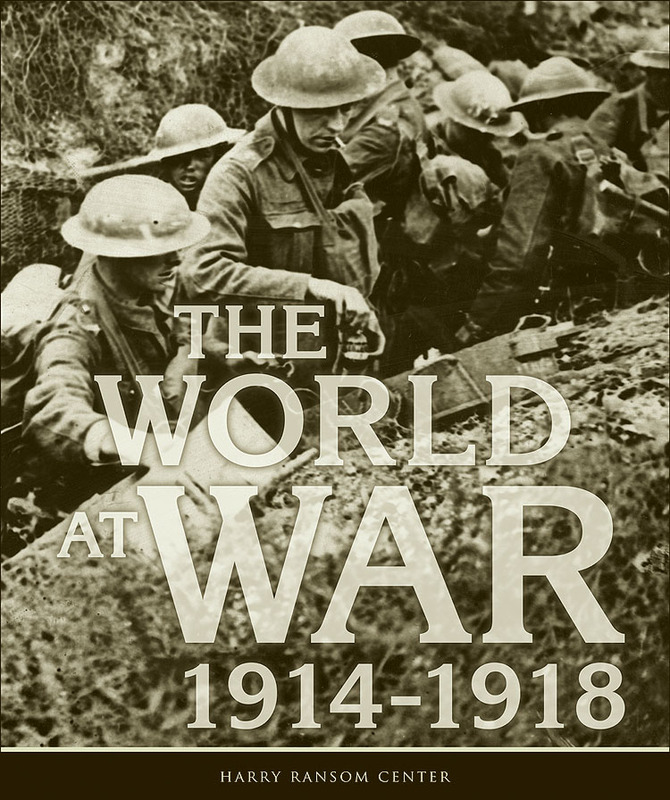 The exhibition The World at War, 1914–1918 marks the centenary of the start of World War I. Once thought to be “the war to end war,” such naïve optimism was quickly shattered by the experience of civilian and soldier thrust into the shared horror of industrial warfare. The war lasted four long years and killed ten million people. Wilfred Owen eulogized those killed in battle as “our undying dead.” Siegfried Sassoon called them “the nameless names.” And Gertrude Stein famously pronounced the casualties as well as the survivors of the war the “Lost Generation,” whose world view had been changed forever. The geopolitical causes, the war’s global expansion, and the outcomes of the war are well documented. The collective personal and national trauma inflicted on all who experienced the war, however, remains a potent touchstone that speaks to a contemporary world still embroiled in conflict. Drawing on the Ransom Center’s extensive cultural collections, this exhibition and companion publication illuminate the lived experience of the war from the point of view of its participants and observers, preserved for a twenty-first-century generation through letters, drafts, and diaries; memoirs and novels; photographs and works produced by battlefield artists; and propaganda posters and films. Jean M. Cannon and Elizabeth L. Garver are co-curators of the Harry Ransom Center gallery exhibition The World at War, 1914–1918 . Cannon is Literary Collections Research Associate at the Ransom Center. Prior to joining the Center, she completed a Ph.D. in English at the University of Texas at Austin, where she specialized in British and American literature of the First World War. Garver is French Collections Research Associate at the Ransom Center, where she has worked since 2000. She is currently a Ph.D. candidate in modern European history at the University of Texas at Austin.